Roger's update - and happy Year of the Horse! So here we are, the end of January (thank goodness - least favourite month of the year!) and Chinese New Year which appropriately for all of us at Rockley is the Year of the Horse. Roger arrived here nearly 3 weeks ago and so its more than time for his update. Roger is not yet landing heel first so we have to be very careful which surfaces he works on at the moment but all that walking around on the tracks is already improving his sole and bars. 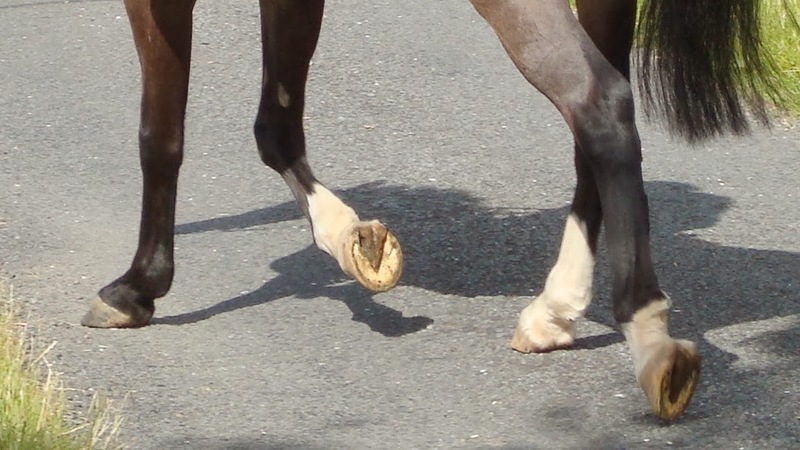 This was his lamest foot; he is now sounder on it than he was initially but it is still weak and as you can see from the position of his heels its an under-run foot which is not yet properly supporting his limb. The stripe is useful as it gives an indication of how the back of his foot is changing and starting to build up and you can also see from the position of the nail holes how his foot has grown down. Here he is on day 1, with a toe first landing and in remedial shoes. His full background is here, here and here for those who are interested. This is the same foot 8 weeks later. A shorter toe, stronger palmar hoof and most importantly a better landing which has made him more comfortable and given him a freer stride, which you can see in the linked footage above. ...the day after below (apologies for the blur) and at 8 weeks in the lower photo. Although the lighting and focus are far from perfect, there is quite a change, I think you will agree, and a clear sign that he has been working his frog and palmar hoof over the last few weeks - well done Peter! I've long suspected that one of the important but hidden factors affecting how a horse's health improves is positive thinking and positive action. That may sound odd - and it would be fascinating if it were possible to measure what the horse's thoughts were - but what I mean (in this instance anyway) is the effect which an owner's positive or negative thoughts and actions have on the horse he or she is taking care of. There was a remarkable study carried out at Harvard by a psychology professor, Ellen Langer. She took 2 groups of elderly men to a retreat which was fitted out exactly as it would have been in the 1950s. One group were asked simply to reminisce about that period in their lives, the other group were asked to take it a step further and try to relive that time, acting as if they were much younger. "Before and after the experiment, both groups of men took a battery of cognitive and physical tests, and after just one week, there were dramatic positive changes across the board. Both groups were stronger and more flexible. Height, weight, gait, posture, hearing, vision—even their performance on intelligence tests had improved. Their joints were more flexible, their shoulders wider, their fingers not only more agile, but longer and less gnarled by arthritis. But the men who had acted as if they were actually back in 1959 showed significantly more improvement. Those who had impersonated younger men seemed to have bodies that actually were younger." Of course this study wasn't done on horses but our horses are often more in tune with us and our feelings than we may realise and this can affect their physical performance as well. For instance, its quite common for a rehab horse to still be footy on tough, uneven surfaces even after they have been here a few weeks. 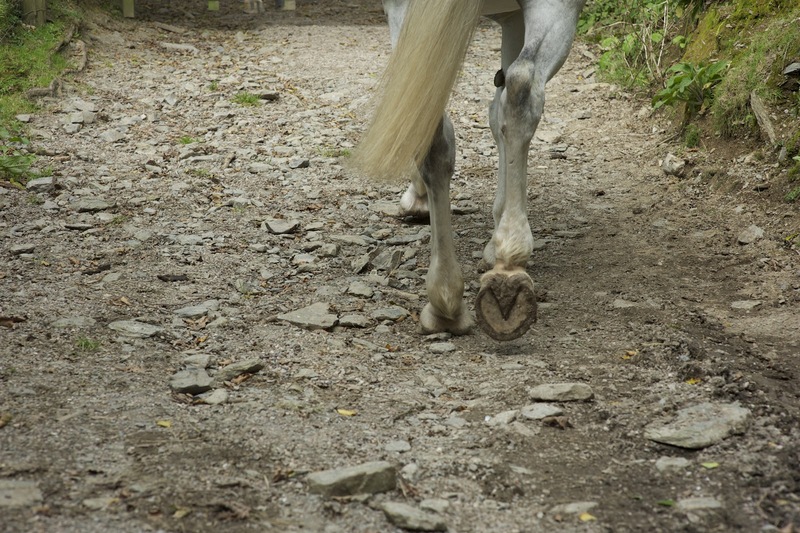 Nearly always the horse is actually perfectly capable of crossing stony ground without any harm but will be more careful than a horse with a completely healthy hoof. However, there will often be a dramatic difference in the horse's gait and demeanour depending on whether I or the owner is at the end of the lead-rope. I never mind a horse slowing down and being cautious over a difficult surface but equally I don't ask them to work on a surface they aren't able to cope with. The result is that generally they become more confident fairly quickly and - like the group in the Harvard study - actually more capable over time. For the owner its usually a lot more nerve-racking. For many of us, the first time we saw our horses working without shoes was a real worry. 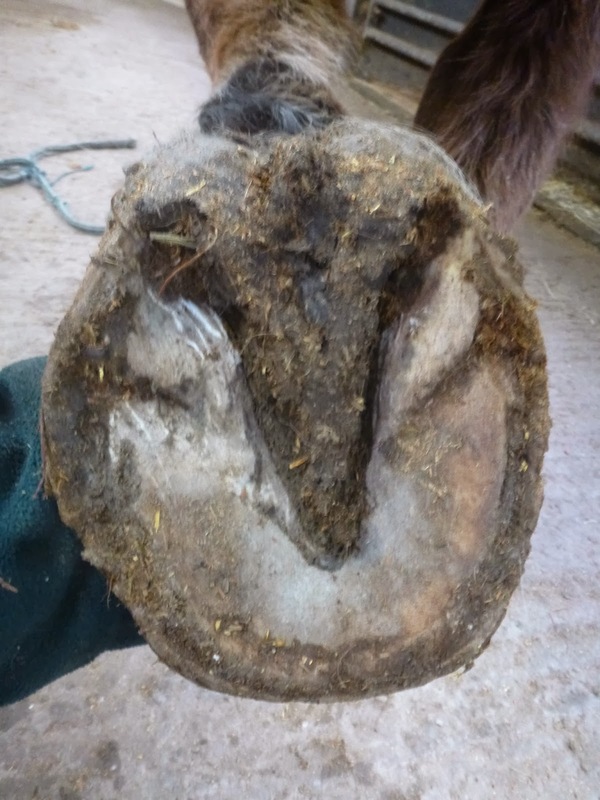 This is of course utterly natural - particularly if you've been taught all your life that horses cannot cope without shoes and that their feet are so delicate that they need constant protection from a rim of steel. 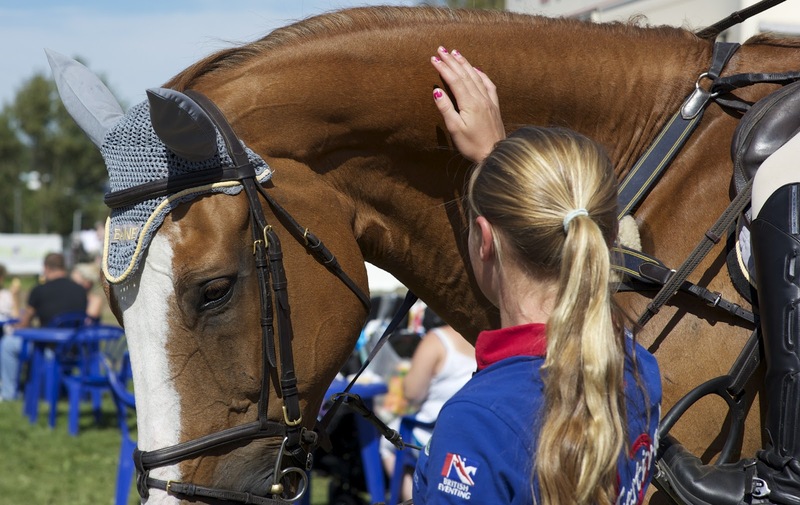 The result is that typically, the first time the owner and horse together approach a surface tougher than grass, the owner will turn towards the horse and tense up, often taking a deep breath and saying something like "Oh, poor you, are you ok?" in a voice full of concern. 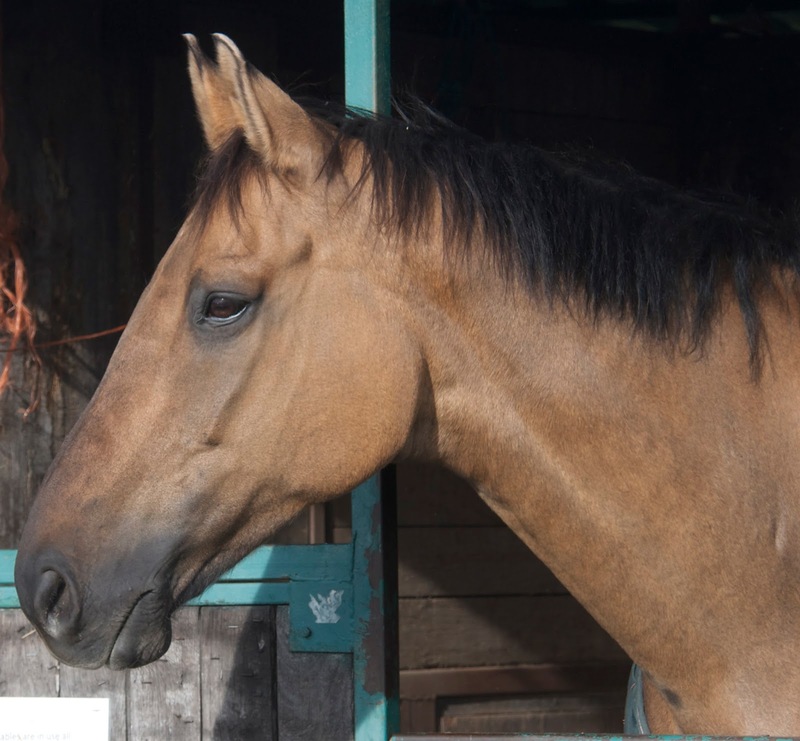 For the horse, the message is immediate and clear: the owner has lost confidence and is worried - there is a problem and probably every reason for the horse to be concerned as well. 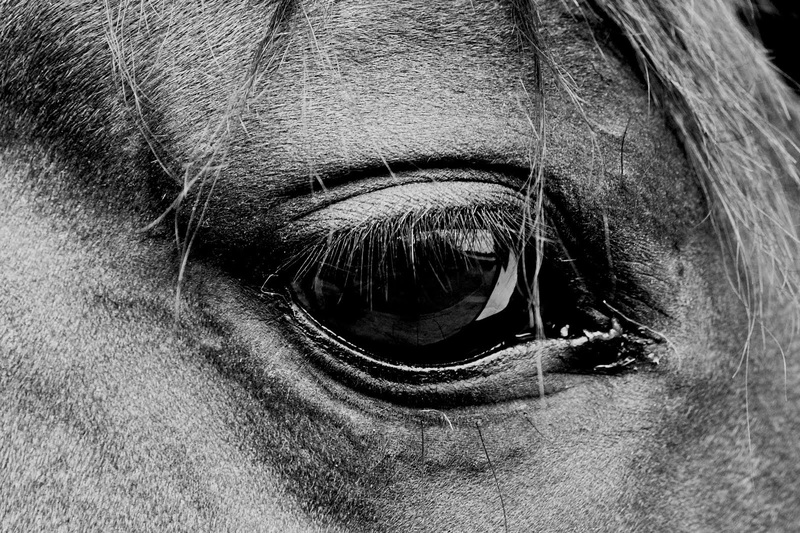 Ironically, the better and stronger the relationship between horse and owner the more forceful the message will be! 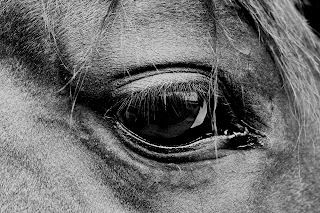 Not surprisingly, once owner and horse are tense and worried then everything becomes more difficult and not only will the horse most likely find the tough surface more of a struggle than normal but both owner and horse will have reinforced in each other the belief that this really WAS a struggle. You can see how this could easily become a vicious circle, can't you, and how it could be even worse during ridden work, when a tense rider can block the horse's movement as well? Now, I'll make it clear that I am NOT suggesting you should drag your horse over ground he is unable to cope with - that is unfair, counter-productive and irresponsible. After all, YOU are responsible for choosing the route and terrain you and your horse are working on and so its up to you to make sure he can cope with it. Having chosen, however, you should have the confidence that it will be beneficial, not harmful, for your horse; it will be a big help for your horse if you can convey this confidence to him via your positive attitude. It will not only make him more confident and more relaxed, it will most likely improve his way of going; working and moving well will lead to more confidence and better movement, better movement to healthier hooves. By the same token, don't always take the easiest option because there is otherwise a good chance your horse will never be able to cope with the more difficult option. Its a balancing act that requires sensitivity as well as confidence. Finally, here is one more example of the contrasting effects of positive and negative action. "The rice experiment is a demonstration of the power of negative thinking (and conversely, the power of positive thinking). 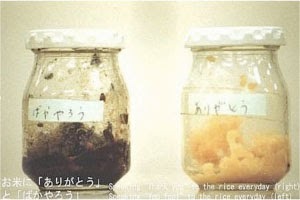 In this experiment, Dr Emoto placed portions of cooked rice into two containers. On one container he wrote "thank you" and on the other "you fool". He then instructed school children to say the labels on the jars out loud everyday when they passed them by. After 30 days, the rice in the container with positive thoughts had barely changed, while the other was mouldy and rotten." It would be an interesting one to try on your horse and his hooves, don't you think?! Brigitte has now been here for just over 8 weeks and her photo updates are long overdue. She arrived landing very clearly toe first and with all sorts wrong with her feet. The top photo shows her feet on arrival - under-run with a long toe and a weak palmar hoof. The more recent photos below show that changing although she still has a lot to do. Her soundness has improved, though, and looking at the sole shots you can see why. 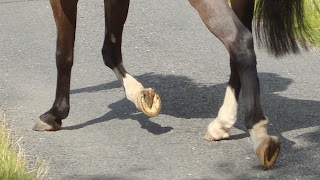 The top photo, on arrival, shows an asymmetric foot with not only the under-run heels to contend with but a ridge of sole which is usually a sign of an unstable hoof capsule. Today the same foot looks much better - more symmetrical but still with the ridge of sole. 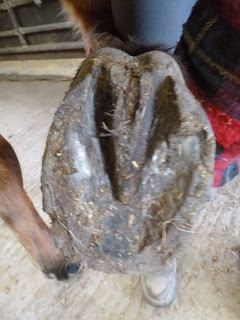 That will grow out as her new hoof grows in so its not something to worry about at the moment. Its also a good reason why - in a foot like this - trimming bars or their extensions is not a good idea as for now they are vital to the foot's strength. The LF is the more under-run of the front feet but its slowly coming back and the bull-nosed profile is also improving. 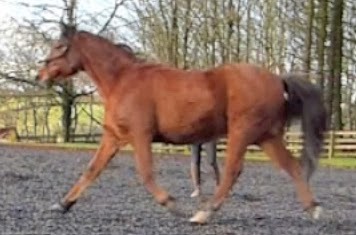 I had a nice email from Kate, who owns Rolie, sending me this clip of them strutting their stuff in one of their recent outings; they are now working at Elementary level. Rolie2014 from Nic Barker on Vimeo. 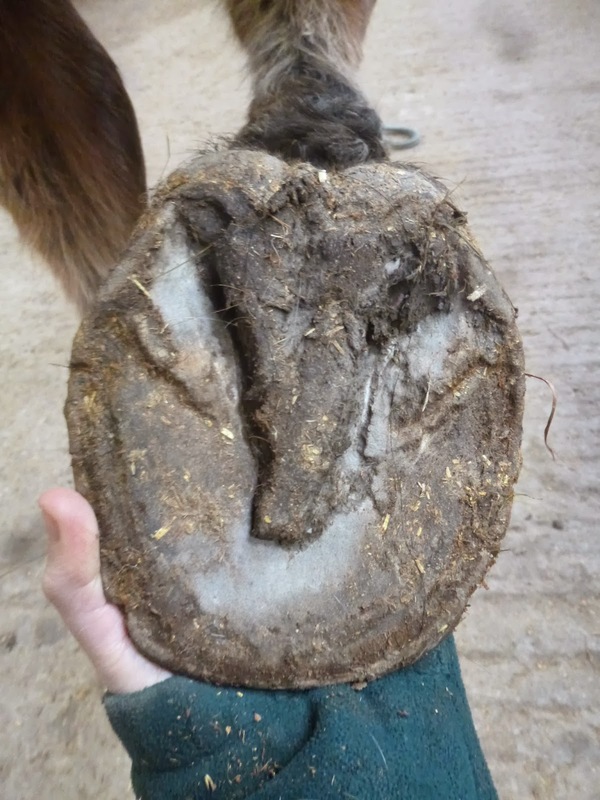 I've had a few people recently asking me to post about the "pyramid" for hoof health. When "Feet First" was published we used a pyramid to show what a healthy hoof needed but for many years now I've thought that hoof health is more like an iceberg. Why? Because you can't see 90% of it, you can only see the most insignificant part. In this case, that's how the hoof is trimmed. 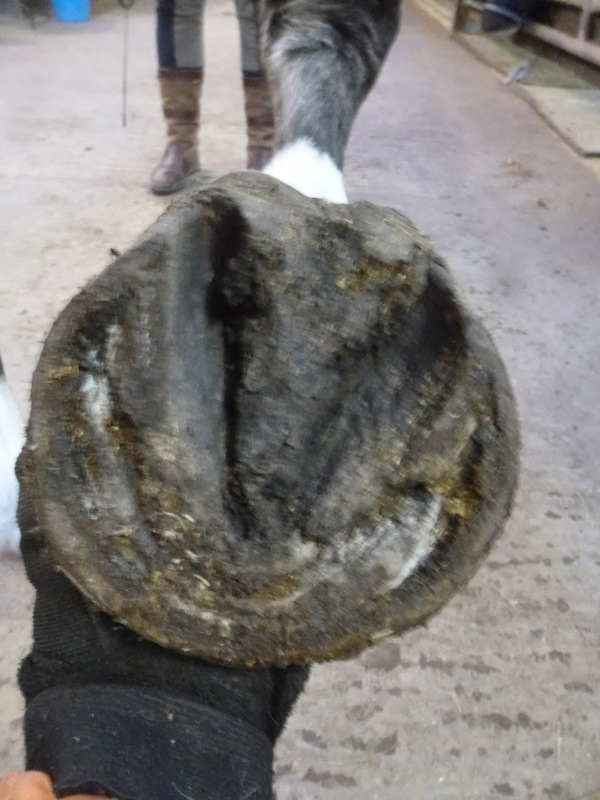 You can trim all you like but if the critical foundations of correct nutrition and plenty of exercise aren't in place, you are wasting your time and unlikely to improve the health of the hoof. We had a lovely sunny day yesterday - thank goodness! And I took the opportunity to get lots of filming done while I had the light. I'm playing around with a new camera and it has a totally different field of vision to my old camcorder so you'll have to be patient with me as I get the angles and resolution sorted out over the next few weeks. Anyway, first up is Peter. 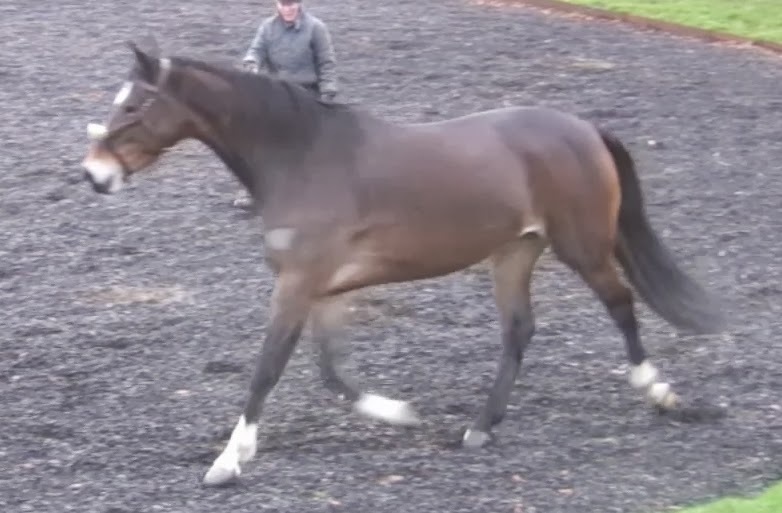 We took footage of him on a circle the day he arrived, as he is a chilled out sort of chap, so the comparison footage is of him at the beginning of December (when he was in remedial shoes) and 7 weeks later (when he had been landing heel first for a few weeks). As you will see, he has a fairly unique action and particularly behind his movement was quite choppy and ungainly - the still above is from his December footage - but it seems to be improving as his landing and foot balance are changing. This still from his January footage shows better extension in front and reach through from behind. 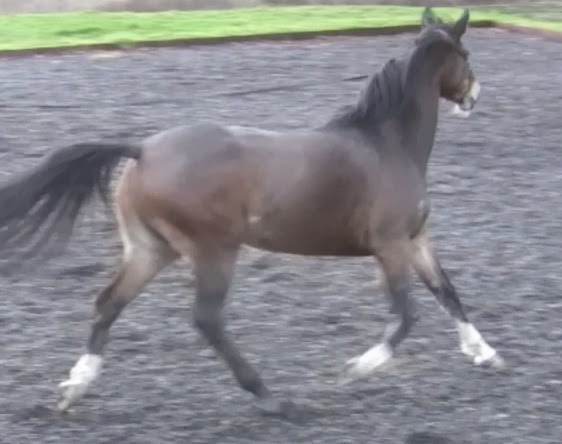 Although his gait is still unmistakeably Peter I think it looks smoother and more comfortable and I am hoping it will improve further over the next weeks and months as he grows in his new hoof capsule. Peter-circle footage from Nic Barker on Vimeo. I noticed at the weekend that views on the Barefoot - slow motion film had suddenly shot up again (its now at over 10,500 plays) but it took me a while to find out who the new viewers were. Turns out it was a Facebook group of (mostly) US based farriers who'd started playing it after it was posted by one of their members. There were quite a few interested comments, some supportive comments and a few posters who had made the decision that the whole thing was an internet hoax and a pack of lies - they were, of course, less constructive in their comments (though they were not clear about what they thought we were faking. Perhaps that the shoes had been photo-shopped out?!). However, there was one pungent and repetitive criticism which a number of the group made; several of them said that "the music sucked". I'm not sure whether it was Brokeback Mountain or Labi Siffre whom they hated most, and it wasn't the politest way to express their differing sentiments, but personal opinion is fair comment and one person's favourite track is another person's anathema. Barefoot in slow motion - take 2 from Nic Barker on Vimeo. Personally I don't think it quite has the piquancy of the original, but each to his own...What do you think? I think it must be human nature to try to simplify things ad infinitum. Perhaps we prefer concepts to be black and white because it makes them easier to understand; perhaps we like to abbreviate because of laziness or lack of understanding or perhaps the detail just gets lost as the message gets passed along from one person to another. The problem is that not everything can be reduced to a soundbite or a one word answer without some big losses. Trimming hooves is a really good example. Those of you who regularly read this blog know that I have posted a lot in the past about the dangers of over-trimming. You also know that most of the big changes that happen to the hooves on the rehab horses here happen without any trimming at all. 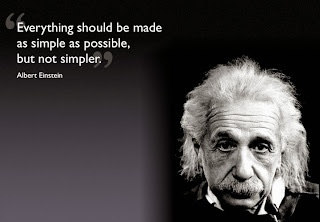 I suppose its therefore no surprise that some people over-simplify - one classic quote online recently came from a lady who claimed I said "trimming was evil"(!) - and its fairly common for a minority of trimmers and farriers to get hot under the collar about lack of trimming, even though the horses here are becoming sounder rather than lamer with this non-intervention. 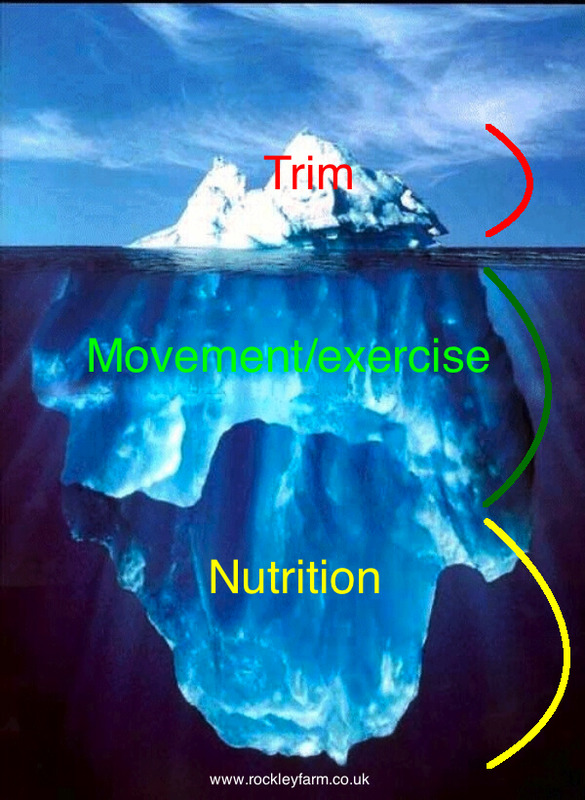 Perhaps the thing they are missing is that its not about trimming, its about soundness. Anyway, for those who are newer to this blog I thought it was about time for a quick summary of what I think are the most important guidelines about trimming - when its helpful and when its most definitely not. 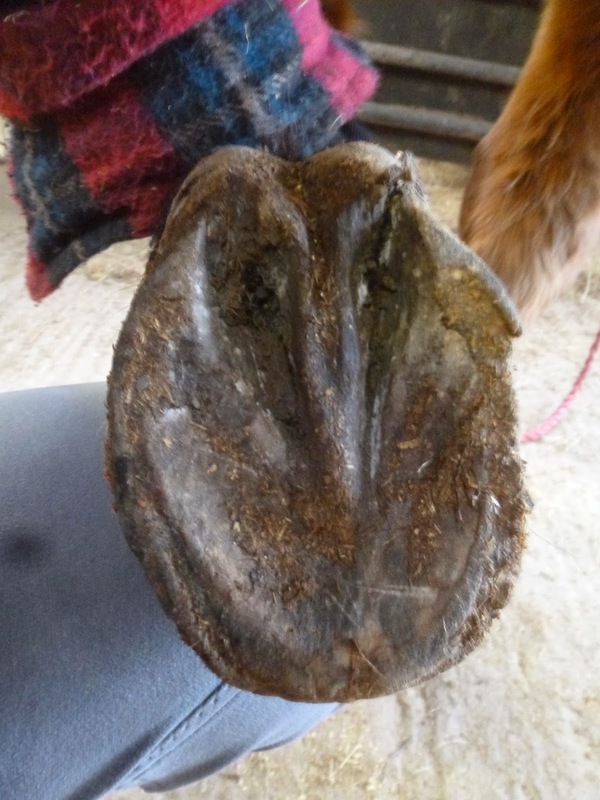 Humans LOVE to fiddle, LOVE pretty things and LOVE instant gratification - and trimming (or, I suppose, shoeing) is the only way to make an immediate difference to how a hoof looks and to make it pretty. It fulfils the need to fiddle as well, so no surprise that we are hooked on it. 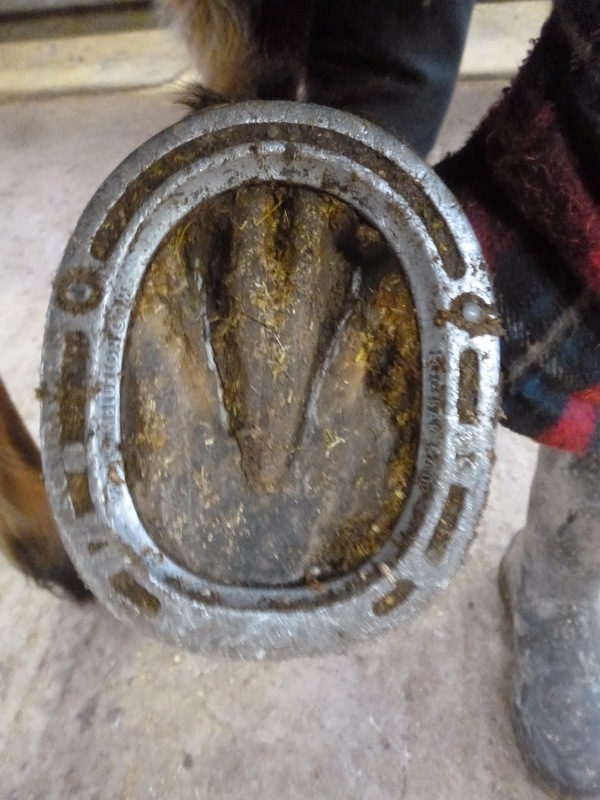 The internet also has a plethora of hoof pictures and all of us would prefer our horses' hooves to look smart rather than ugly BUT although its very easy to lame a horse with a poor trim its much, much rarer to improve their soundness with a trim. Be very, very careful before you rely on a rasp or knife to give you a healthier hoof - and let soundness, not appearance, be your guide. After all, you can only remove hoof capsule with a trim - and what most hooves desperately need is more strength, more structure, not less. 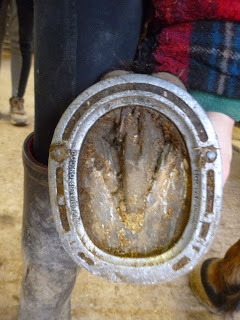 For farriers - and trimmers too - there is a lot of pressure to make hooves conform in appearance; some also have a perception that as a professional they need to "do" something with a rasp in order to earn their money; some have an indoctrinated belief that the horse will fall over and stop functioning unless they come along and trim it every few weeks. In my experience its fine for them to trim PROVIDED that the horse's soundness is never compromised as a result but - here's the thing - if you are paying for the services of a hoofcare professional there should be so much more you can get from them - advice on nutrition and biomechanics, brainstorming on exercise and gait analysis and tips on how to optimise your horse's environment. 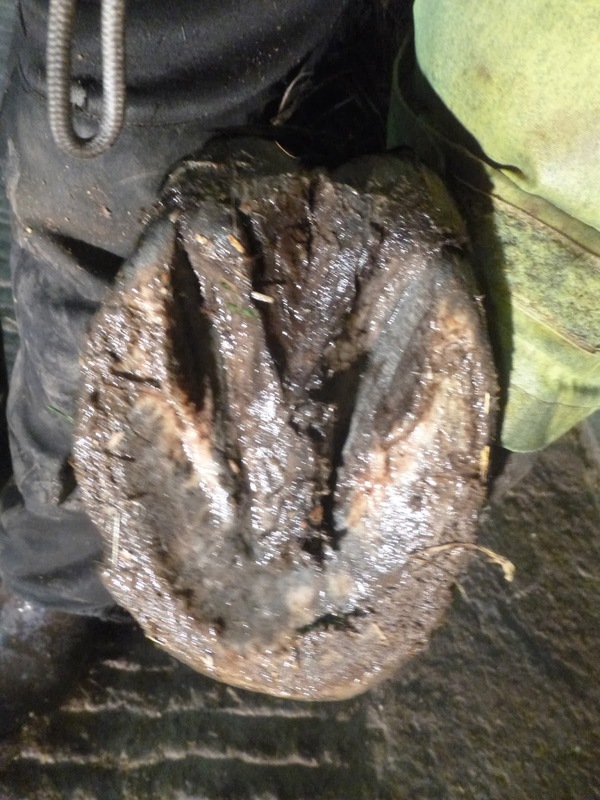 As an owner, you should be paying for their time, expertise and advice not just their handiness with tools; the former is so much more essential than the latter if you want help to optimise your horse's hoof health. Here is something which may surprise you. Horses' feet really don't need as much help from humans - particularly in terms of trimming - as we've always thought. Trimming is a visible intervention but its so much less relevant to a healthy hoof than a good diet and a few miles of roadwork. 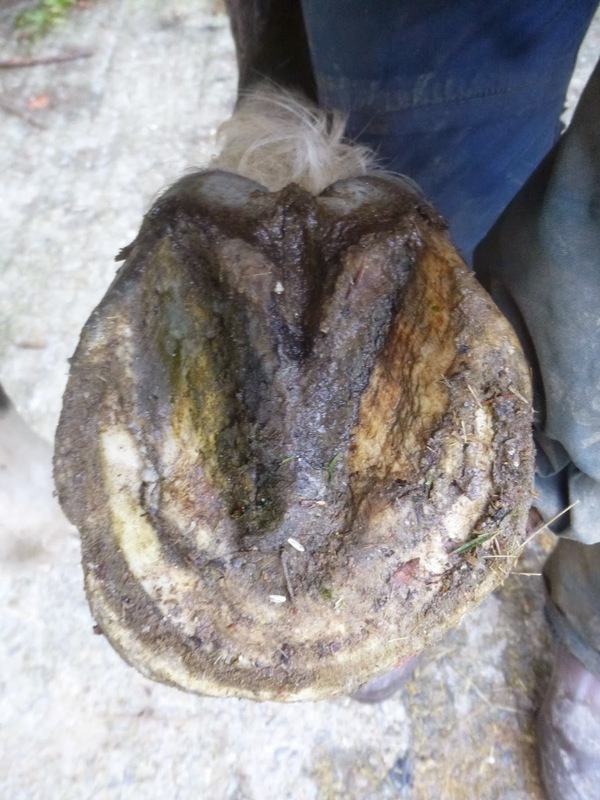 You could trim a weak hoof every 4 weeks for a year and it never improve as much as it would with an optimal diet and better biomechanics over the same timescale. Thats the limitation of trimming. 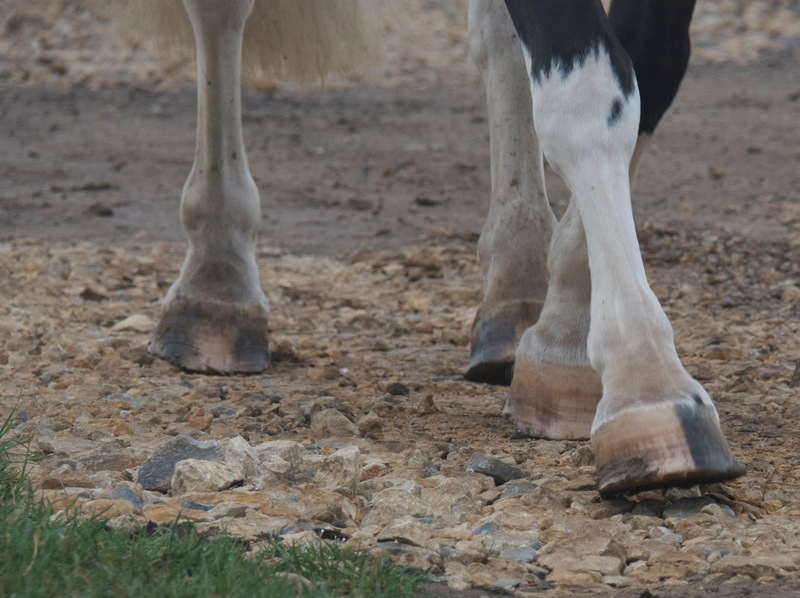 Just as hard-working horses will grow hoof capsule faster, so horses who aren't in work will slow down their rate of hoof growth provided that they have some access to varied surfaces. I haven't trimmed our hard-working hunters for years, but equally I haven't trimmed Tegan the broodmare either, and she isn't in work at all. She can stomp about on the tracks for part of the day but also spends lots of time in the field. She has a good diet and the cracks and poor landing she had when she arrived have steadily improved, even without additional exercise. 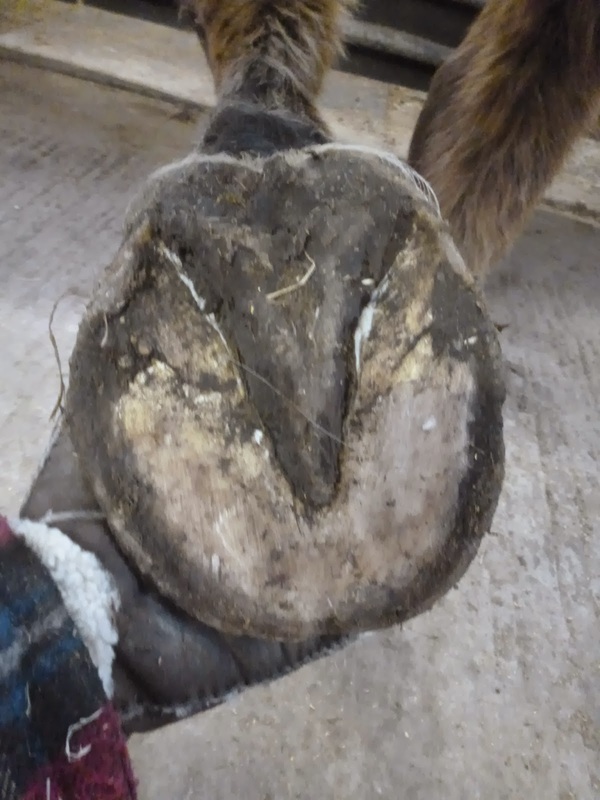 Her hoof health has improved, but not because of trimming. 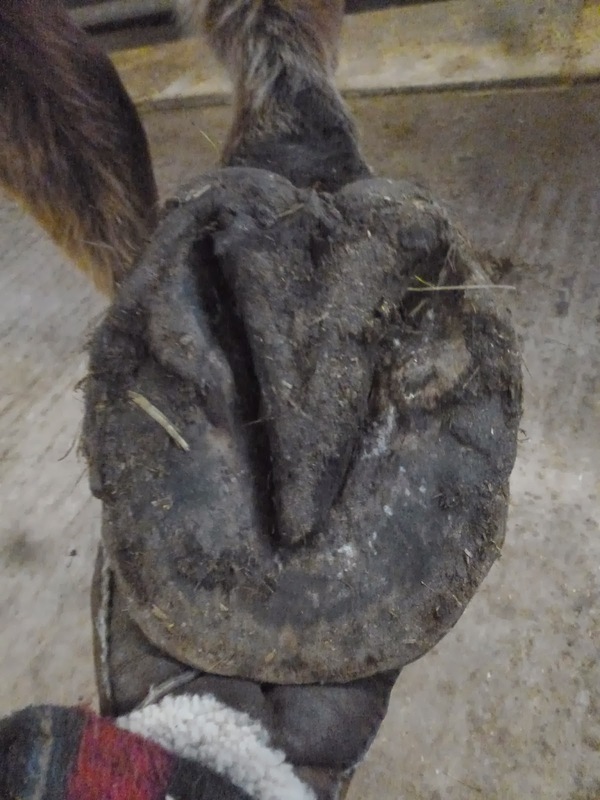 There will always be a multitude of vociferous opinions online, in your yard or from your friends and neighbours about how your horse's feet should look, whether he should be shod or not, what work he should be doing and and how you should be looking after him. Some of these opinions will be good, some of them will be rubbish and its up to you to disregard the nonsense and use the sensible stuff. So how do you go about selecting good over bad? For me, there is only one safe way. Listen to your horse and trust what he is showing you about his health, his happiness - and his soundness - above anything which the "experts" tell you. 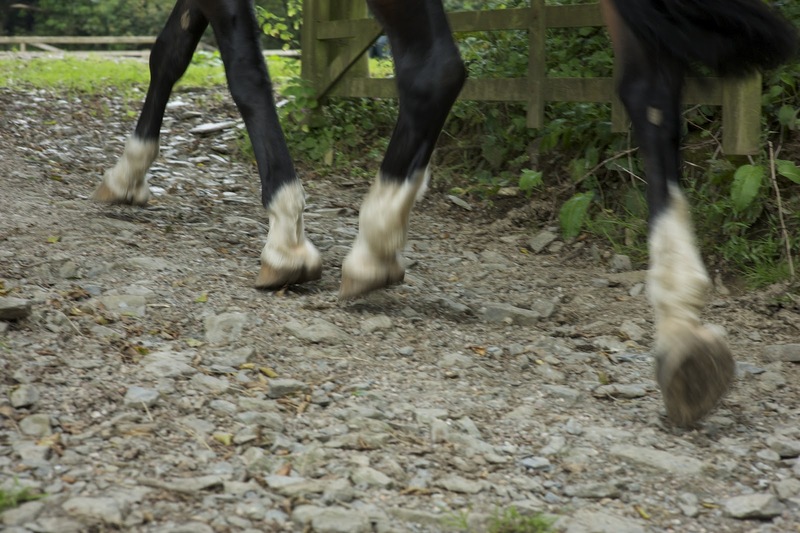 Your horse is the ultimate expert on his own hooves and if he is anything like most of the horses I see here, he already knows how to grow healthy feet - he just needs to be allowed to get on and do it. For those who are interested, some of my older posts about trimming (or not) are here, and you can also search the blog or look at the "Key blog posts" page at the top of the blog. Roger has lots going on, including a DDFT tear which has not responded to IRAP treatment or bursa medication. He has more recently suffered a check ligament injury on his RF and the day he arrived, to complete the set, had suddenly become much lamer on his LF so it may be a while before we know where we are going. 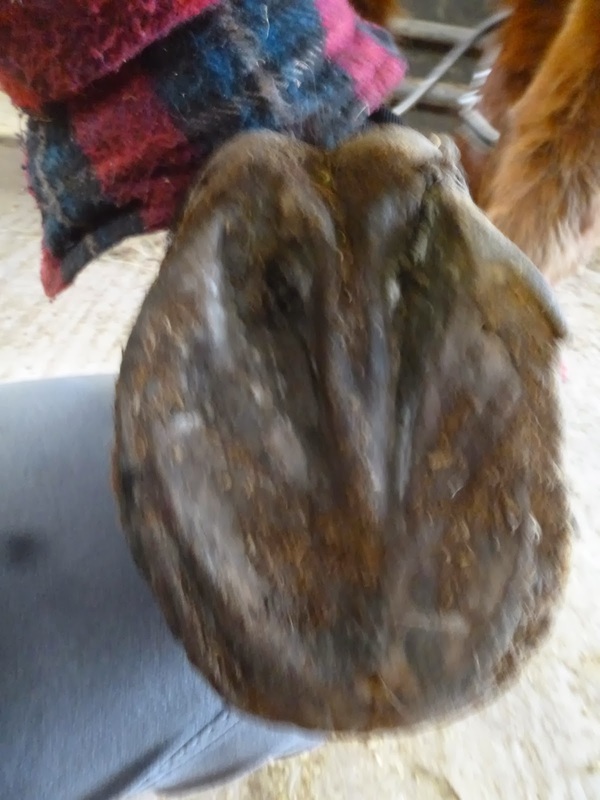 His feet are flat but he has a reasonably decent frog and after pulling his shoes a few weeks ago is already growing in a better connected hoof capsules, as you can see from the lower photo. This is his problem foot at the moment and the distorted hairline isn't a good sign but that is something that should change as his foot becomes less under-run. Brigitte has been here for 6 weeks now - she arrived at the end of November following long term lameness which blocked to the palmar hoof. She'd had long spells of box rest and (like Peter) remedial farriery plus some drug treatment but she had failed to improve. She has not been quite as fast as Peter to improve her landing on hard ground and filmed on concrete she is still landing flat or toe first but she is making big changes to her way of going and on a more forgiving surface she is definitely landing better and feeling more comfortable than she was. 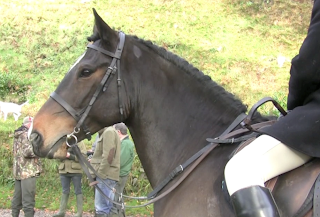 This is a still taken from her initial circle footage - we waited a few days after she had arrived to film her in the arena as it would have been asking too much for this level of self-control immediately off box-rest. 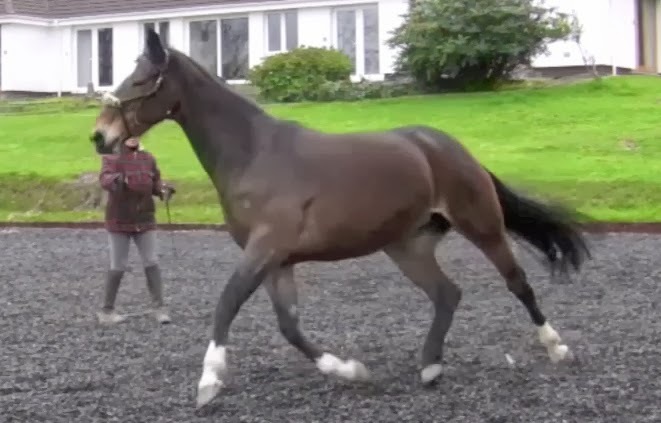 Although she is keen to get going you can see that she is not fully extending in front which is typical of a horse landing toe first (though most horses will find it much easier to land correctly on an arena surface than on concrete). 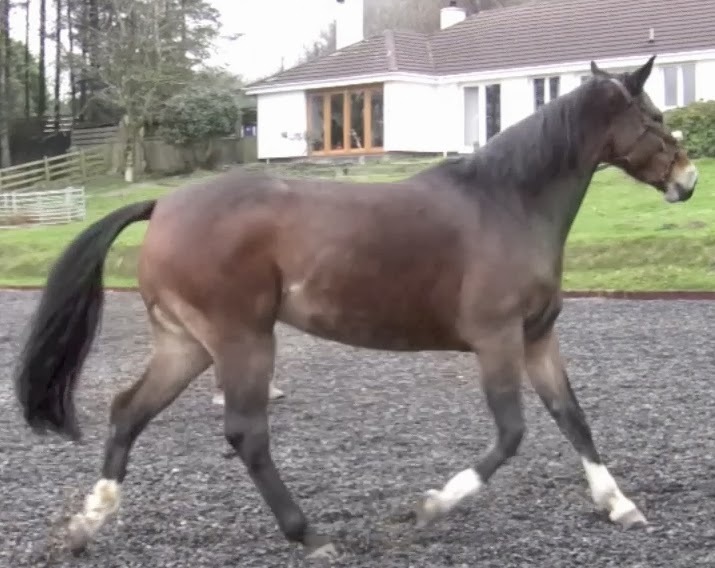 Its tricky getting comparable stills from video footage but I hope you can see that her movement now - as compared with 5 weeks ago - is more relaxed with a longer stride and more even footfall. You can also view the footage itself below, which gives you more of an idea. 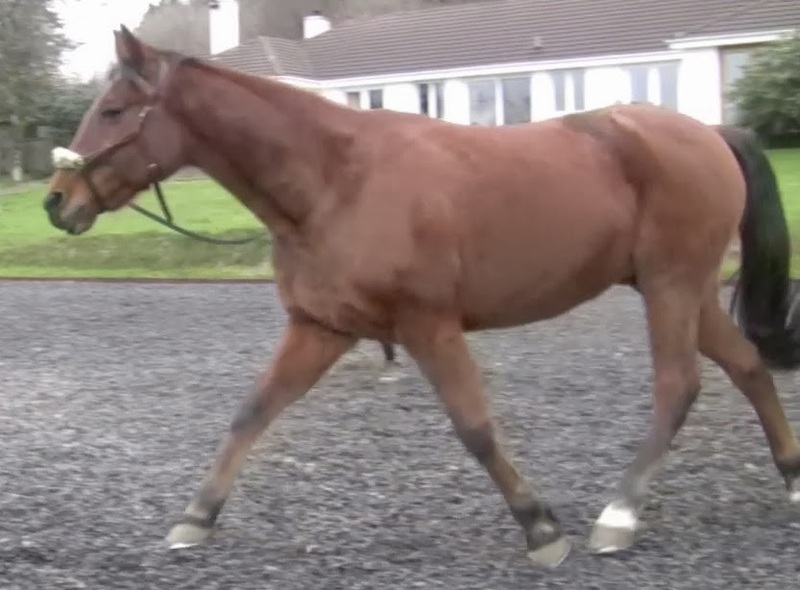 You can see the same on the other rein - longer stride and better reach through from behind as well as more suspension. Brigitte has made good progress even though at the moment she can only work on easy surfaces and so therefore has a long way still to progress. Her next challenge is to develop a strong enough heel and frog to show this sort of landing even on tough terrain. More on her soon! Brigitte from Nic Barker on Vimeo. Back on, and happy new year! Well, I hope you've all had a good start to 2014. 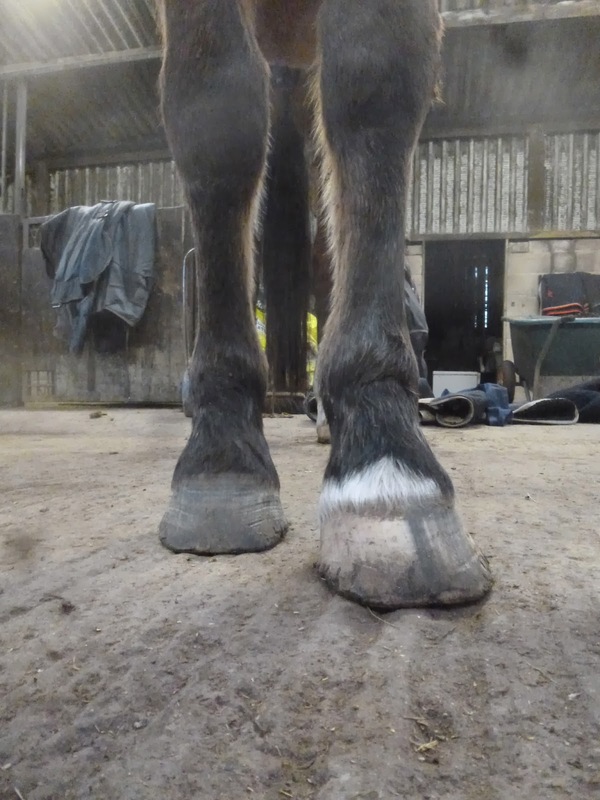 Its been wet, wild and windy here - as I think it has in most of the south of England - but that hasn't stopped the rehab horses from sticking to their New Year's resolutions of growing better feet. Time for an update on Peter, who was the last horse I posted about before I took a break from the blog before Christmas. At the top are his feet the day he arrived, in bar shoes and with a navicular diagnosis which had been made nearly a year before. A photo taken the day after his shoes came off shows a contracted frog and heel, weak quarters and poor medio-lateral balance. This photo, just over 4 weeks later, is already an improvement though he has a long way to go. Nevertheless, the key areas of frog and heels are responding well to being out of the bar shoes and are strengthening nicely. This is critical because its the palmar hoof which is always the source of navicular damage an so improving the health of that part of the foot is an essential step in improving soundness. This will be an interesting angle as Peter's rehab progresses as his toe will shorten still further as his palmar hoof becomes more robust. For comparison, here are his RF shots. This was his worst foot and again there are already good changes happening with his frog and heels, particularly the lateral heel which was very crushed and under-run in the initial photo above. As with the other front foot, this toe will also shorten considerably over the next few weeks. For now another important change is in his landing which has changed on all 4 feet and which means he is now ready for more challenging work on tougher surfaces. Peter from Nic Barker on Vimeo. More on Peter and the other horses soon as I crank the blog back up for another year!